What immediately comes to your mind when you think of paintings by Van Gogh? Sunflowers? Starry nights? Creepy self portraits with bandages that cover up a mutilated ear? Well, my friends, it looks like you can add new subject matter to Van Gogh’s oeuvre: a windmill and tricoleur flag. This painting on the right, Le Blute-Fin Mill (1886) was recently authenticated as a Van Gogh painting. Honestly, I never would have considered this to be by Van Gogh, mostly because of the human figures: not only are the uncharacteristically large, but there are a lot more bodies than you normally see in Van Gogh’s work. But I really like the use of color, and that does remind me of Van Gogh. I especially like the red highlights of the woman’s dress in the foreground. What do you think? Do you like this painting? This authentication is pretty exciting – Le Blute-Fin Mill is the first Van Gogh to be authenticated since 1995. However, admittedly, the painting has long been disputed as by Van Gogh – an eccentric art collector bought the painting and always claimed it to be by the master, but no one took the collector seriously. You can read more about the story and authentication here. In other Van Gogh news, the famous The Night Cafe (1888, shown left) is involved in a dispute regarding ownership. This painting has hung for almost fifty years in the Yale University Art Gallery, but now Pierre Konowaloff, the great-grandson of the previous owner, is trying to claim the painting back. It seems like a pretty sticky situation: Konowaloff’s great-grandfather bought the painting in 1908, but it was subsequently nationalized and sold by the Soviet government during the Russian Revolution. Therefore, Konowaloff believes that the painting classifies as “stolen” and feels justified in claiming it back. I personally don’t think that Konowaloff has a very good chance of getting The Night Cafe back, but what do other people think? Last night I received an email from Ron Hartwig, the Vice President of Communications from the J. Paul Getty Trust. After reading Pamelia Brown’s guest post on this blog, Mr. Hartwig wanted to clarify some of the facts regarding the “Victorious Youth.” He has given me permission to repost the text of his email, and you’ll find it in the comment section for the “Victorious Youth” post. Apparently I’m out-of-touch with the British contemporary art scene. Last night I was watching a clip from Simon Schama’s “Power of Art” series (don’t hate me, heidenkind! ), and Schama mentioned that the artist Howard Hodgkin is of Van Gogh’s “progeny” (in terms of Expressionism). I had to rewind the DVD – Howard who? You can read more about this painting here. I think it’s particularly interesting that Hodgkin often paints his frames (in addition to the canvas). I think this can tie into interesting ideas about objecthood and subjecthood, particuarly since the frame is no longer “containing” or “highlighting” the painting – it is part of the painting itself. I like this painting because it makes me think, “What would happen if you combined a Rothko painting with Edward Munch’s The Scream?” And I also like the bits of blue that peek out from underneath the black swath of color. Have you heard of Hodgkin before? Which of his works do you particularly like? From what I can tell, Delacroix never made Equality Leading the People, and Thoré may have been discussing only hearsay. Nonetheless, this got me thinking. 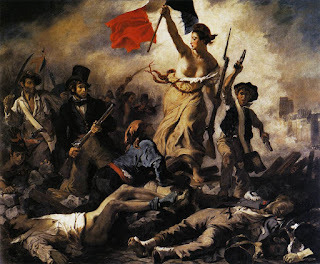 What type of figure would Delacroix have picked to represent Equality? Given the context of the 1848 socialist revolutions, I’m guessing that he would have picked some type of proletarian (member of the working class). I think that Equality Leading the People would have contained an interesting idea that is still relevant with current issues. What if Equality Leading the People was being painted today? What figure would you pick to represent Equality? My first thought was Martin Luther King, Jr. or Rosa Parks. What person (or generalized type of figure) would you choose? 1 Théophile Thoré, “Salon of 1848″ in Art in Theory: 1815-1900, edited by Charles Harrison, Paul Wood and Jason Gaiger, (Oxford: Blackwell Publishing, Ltd., 1998), 181. (Is available online here).